Radish is an edible root vegetable, it is part of the large family that also include cabbages, turnips and mustards plants. They vary in size, color, spiciness according to variety. What is known as the Spring varieties include the round colorful (mostly that pinky red) ones that are being grown by farms and gardeners here in Hawaii. The most common Spring variety is the small or medium red round radish, though we are seeing a lot more French Breakfast radish and Pink Lady heirloom varieties. But perhaps the most common radish in Hawaii is of the Winter variety – daikon. Daikon is a world onto itself so it has its own category. The small bite of heat or pepperiness that is often associated with fresh raw radish is due to the activation of compounds (same ones found in horseradish or wasabi) happening on the enzymatic level when they are chewed. They are loved for this hotness that when in combination with their crispy cool texture, can be a flavorful addition to any salad. 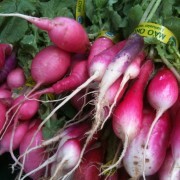 Both the root and the greens of radish can be eaten. – Always wash your radish well before eating. – Cut in half or sliced thin, its adds a great peppery crunch to salads. – In Europe, fresh raw radish is enjoyed in many ways besides salads. Standing in the kitchen smearing a fresh raw radish with fresh churned butter, sprinkling with sea salt and popping in mouth. Layering thinly sliced radish in a lavishly buttered baguette, topped with chopped chives and dusted with fresh ground pepper. – The greens can be eaten like any green vegetable, particularly like watercress – chopped for salad, stir fried, sauteed, steamed. – Both root and tops are also used a lot for pickling. Radish should be bright in color, firm to touch, with a heaviness. Store unwashed in refrigerator in airtight container or bag that will hold in moisture. Use within 7 days.